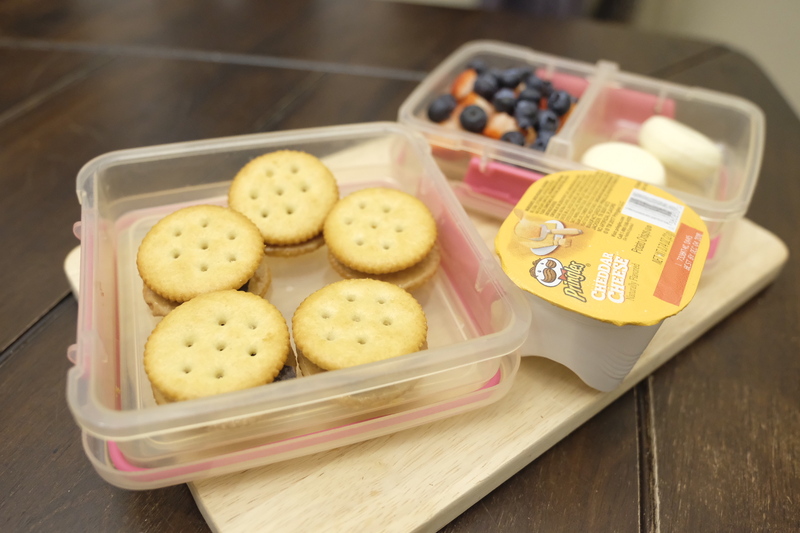 Do you have kids in school who bring their own lunch to school? Are you looking for new ideas for their school lunches? This is my first year of creating school lunches for my daughter, Katie, who is in Kindergarten. I’ve learned a lot this year in preparing her school lunches and I’m always looking for new ideas for lunch for her. Today on the blog I’m going to share with you three school lunch ideas with peanut butter. 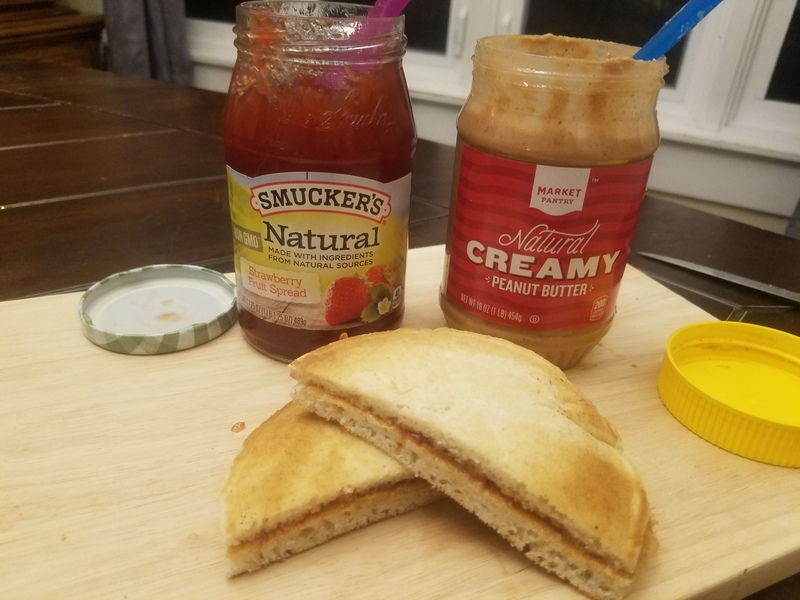 Sometimes I’ll make a simple sandwich with peanut butter and jelly or honey. But other times I like to switch things up make lunch fun with peanut butter. 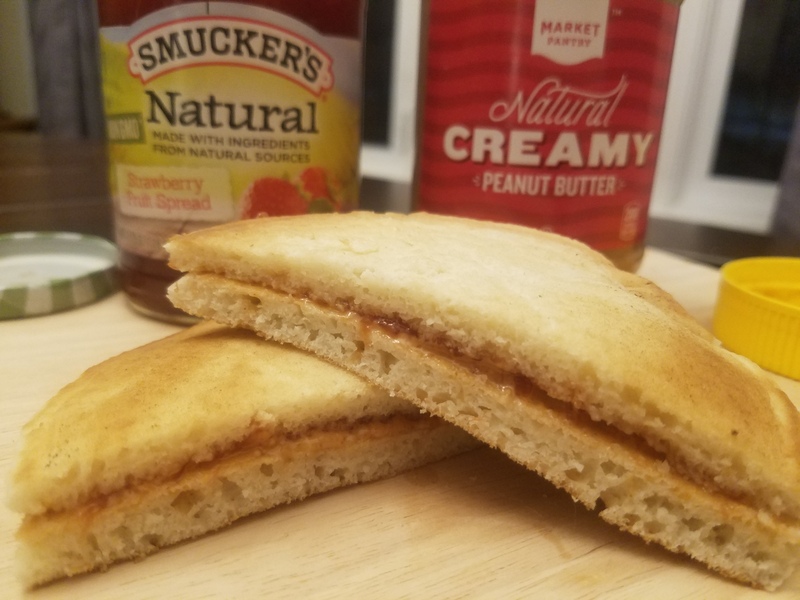 If you have any leftover pancakes, use two larger pancakes or several small pancakes to make a peanut butter and jelly sandwich. 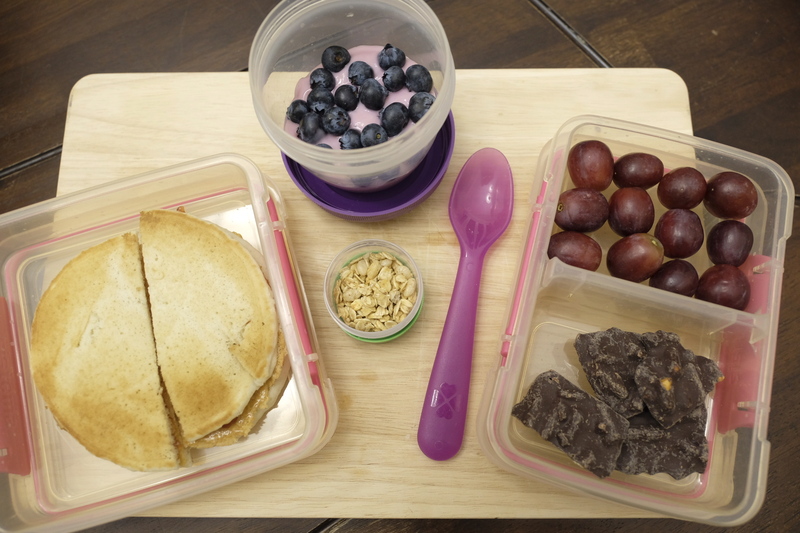 I added blueberry yogurt with blueberries and granola, grapes, and Bark Thins chocolate with pretzel pieces with the peanut butter and jelly pancake sandwich for the school lunch. Katie loves to have breakfast for lunch sometimes and this is a perfect way to use leftovers. 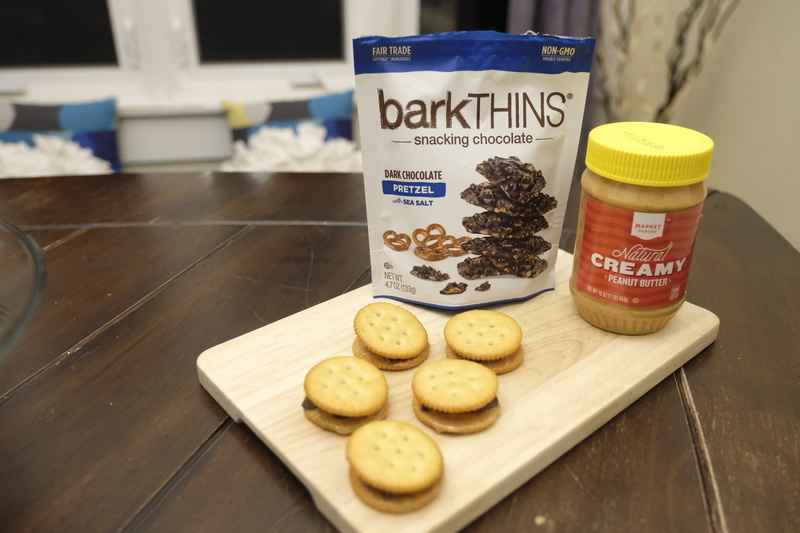 All you need is Ritz crackers, peanut butter, and chocolate. I added a thin layer of peanut butter on each side of the crackers. 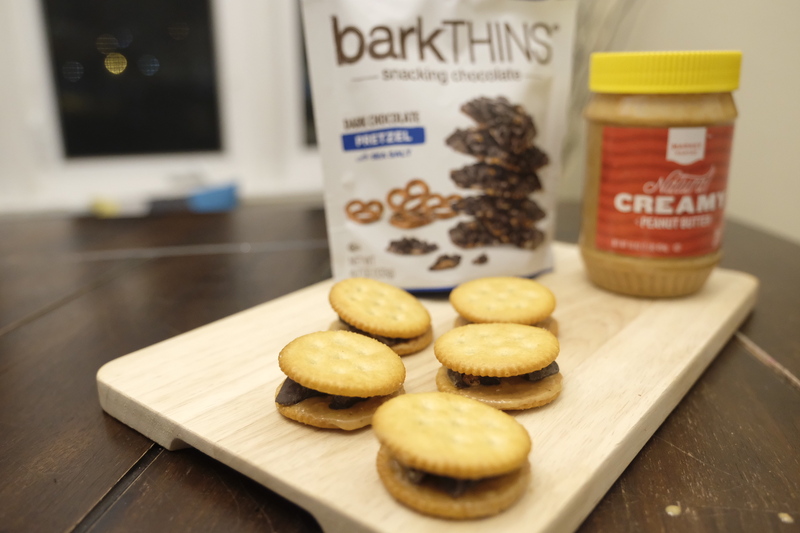 I place pieces of chocolate on half of the crackers and then added the other crackers on top to create sandwiches. I added strawberries and blueberries, couple round pieces of cheese, and Pringles. This is definitely a really fun lunch. 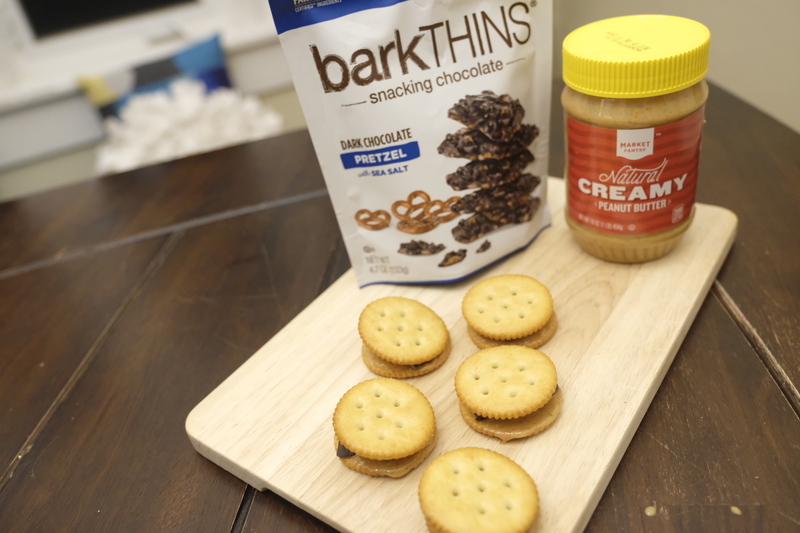 Peanut butter and chocolate takes great together in these peanut butter and chocolate Ritz cracker sandwiches. 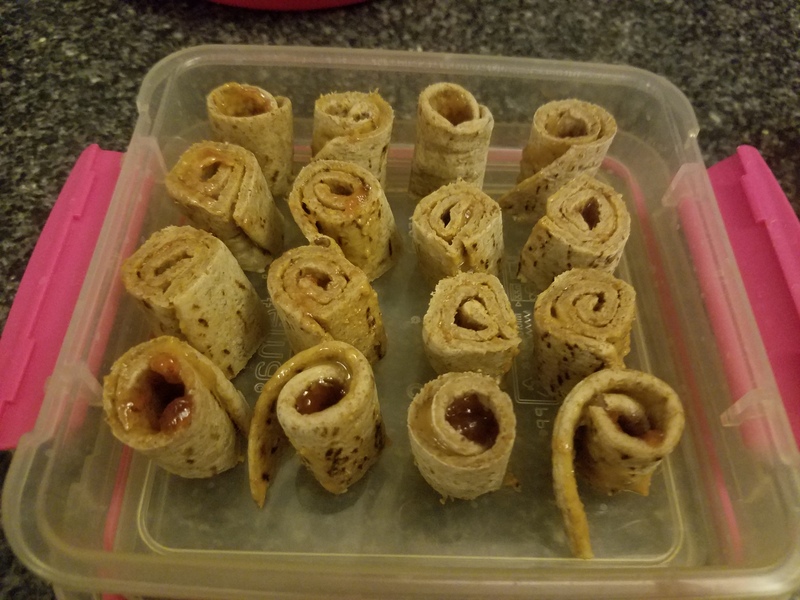 I used flatbread to create these peanut butter and jelly sushi. 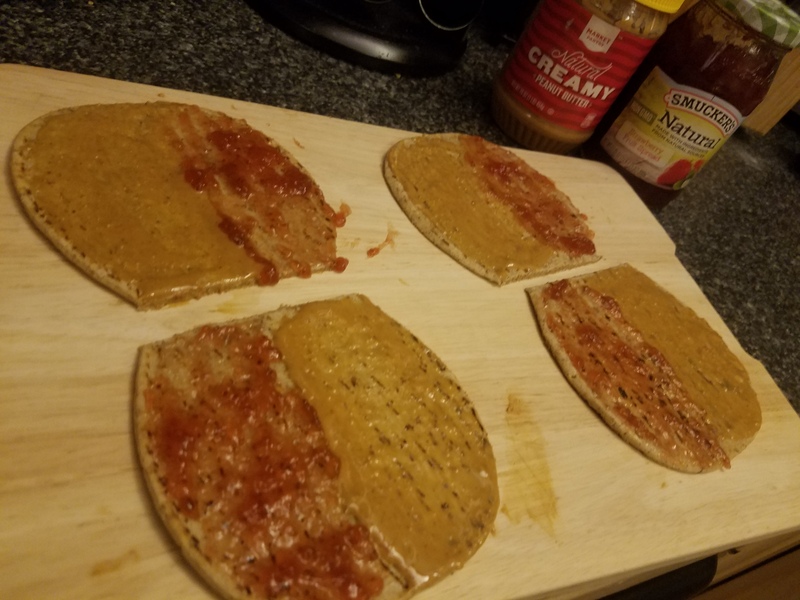 I spread peanut butter and jelly on half of each flatbread piece. 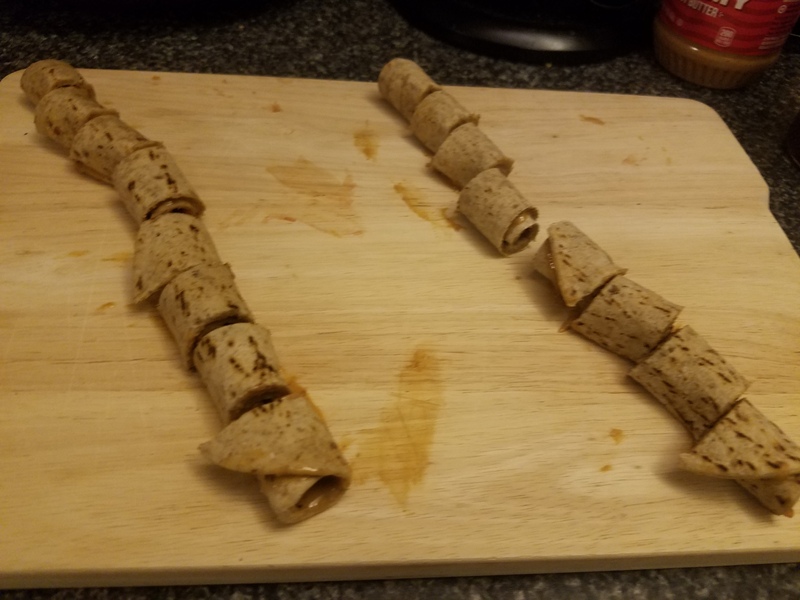 I then rolled them up and cut each flatbread into four pieces. You can also add halves of raspberries and/or blackberries on top of each sushi piece. Katie likes to eat these sushi pieces with a fork, so she won’t get her fingers sticky. 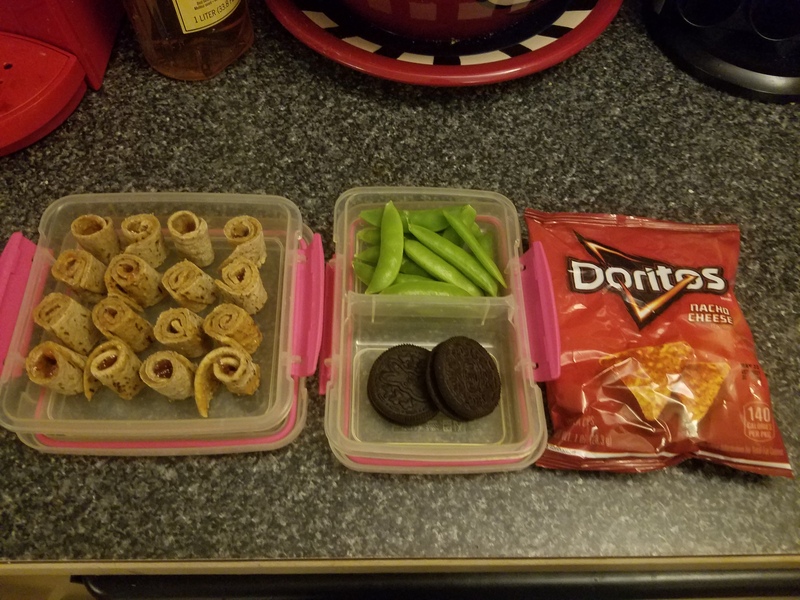 I added sugar snap peas, Doritos, and Oreos with the school lunch. Which school lunch are you going to try for your kids? What school lunches do your kids love? Why have I never thought of pb&j pancakes?! I just bought a box of frozen mini pancakes from Trader Joe’s and it would make a perfect lunch! I’ll have to sub sunflower seed butter since no pb is allowed at her school. 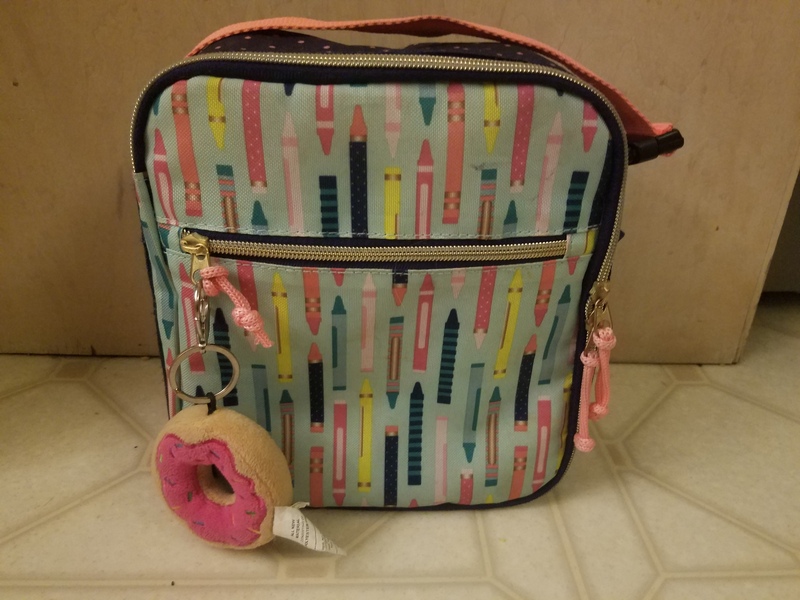 My little one isn’t in school yet…she is 2 1/2…but I’m always looking for creative things to feed her and hopefully get her to eat! My youngest will be 2 at the end of this week. She’s picky about certain things at times, but at the same time she’ll eat anything. She loves vegetables. One of her favorites is sweet peppers. I’m with Myriah, also have a 2.5 year old. But we looooove raw peanut butter (and almond butter) so I’ll incorporate these to change things up! Great tips for picnics, too! peanut butter on crackers are my favorite! i need to do that for my daughter. Cute ideas! My son is really into hummus, carrot sticks, and apple slices (super easy to prepare), but also loves peanut butter sandwiches cut into cookie cutter dinosaurs. I love finding new ideas for lunches! 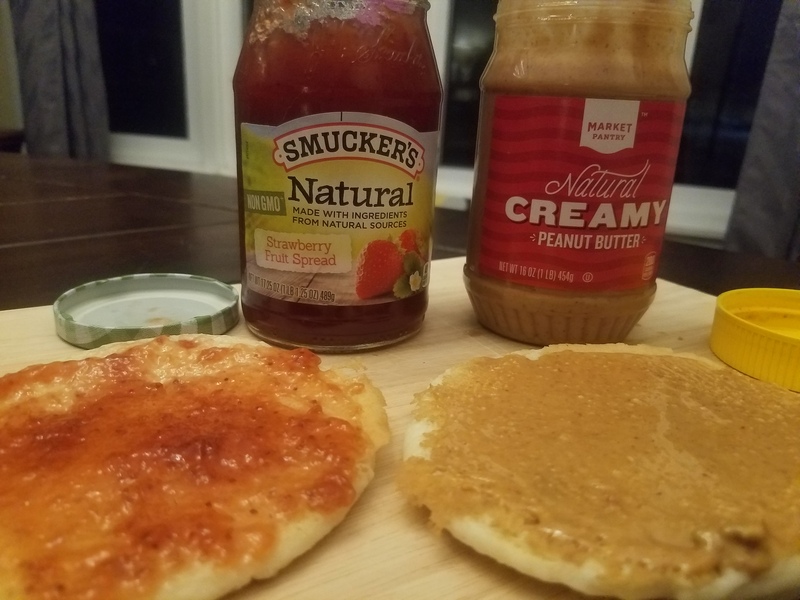 The PB&J pancake are such a fun twist! And the peanut butter and chocolate combo looks delicious! I love peanut butter so I wanted to read this and get some ideas. Which options is the least soggy? I’m guessing the crackers one. My kids love peanut butter… and all of these options!! Sometimes, if we don’t have pancakes, we use frozen waffles (toasted of course) to make a PB&J sammy! These ideas are so cute! I love the pancake idea, I think that’s my favorite! I like the sushi idea. Very creative and so easy to make for a quick lunch. i love me some pb & j! I love all of these! The sushi is hilariiius and functional! Will be giving these a try.